Mayan Name: IMOX / Imix. Compatibility: Crocodile, Serpent, Water, Reed, Earth. The sign of Crocodile (Imix) is primitive energy, power, the source of life. The meaning of the sign is water, rain. The patron deity is the red Dragon. 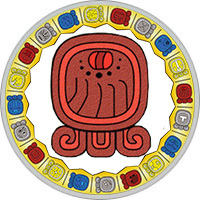 In the representation of the ancient Maya, the Earth rested on the back of a huge two-headed crocodile. According to another version, a completely flat surface was supported by the old Gods, the sky rested on four trees. At the very center of the system was the seiba — the axis of the world, connecting the center of the Earth with the heavens and the underworld. This myth is associated with the second name of the sign — the World Tree. Imix symbolizes fertility, vitality: water is the most important component of the human body. The energy of water embodies the inner forces that are dormant in man. People of the Maya Crocodile sign are emotionally affected, act impulsively and resolutely. Always express their desires directly, listen attentively to their own feelings. They have a highly developed intuition, feel a strong connection with the natural world. Crocodile is a talented person who can bring something new into the world if he can cope with internal contradictions. Too quick-tempered people often make mistakes, succumbing to momentary emotions. They need friendly support and good advice. People of the Crocodile sign feel great in a relaxed atmosphere when there is no need to follow strict rules and clear instructions. The creative professions are most suitable for them: a writer, an artist, a designer, a musician. A subtle connection with the world of nature and a highly developed intuition allow one to draw inspiration from the simplest of things. A huge role is played by the nearest environment: The Crocodile needs a calm atmosphere, only in this case it can create. In general, the career of the people of this sign is developing quite successfully, financial troubles are bypassed. Crocodile is constantly looking for love adventures, he needs to be in captivity of passions. Unfortunately, it is not constant, the desire for new sensations pushes it into the embrace of a wide variety of people. Blinded by feelings, people completely lose control of themselves, follow instincts. During a life some bright novels experience, love relations for them — a holiday, fireworks of passions. Crocodile respects the chosen ones, manifests itself as a good family man, but he himself needs a tender and caring partner. The Crocodile man has a strong character, always firmly follows the intended goals. If in his personal life he allows himself to be frivolous, in the workplace he is a collected, purposeful person. It can dramatically and drastically change its decision, but not because of weakness or doubt. The impulsive man is just fed up with this business, it attracts new perspectives. In family life, he is a loving partner, tirelessly caring about the good of his loved ones, gets on well with the children. He devotes much time to rest, especially likes to spend time outdoors. Woman Crocodile — an airy, unearthly creature, prefers to trust sensations, rarely takes into account the reason’s arguments. She has a great interest in everything mystical, he believes in fortune telling and predictions. Often sees prophetic dreams, which he tries to follow. She often gets into unpleasant stories because of his inclination to trust everyone without exception. Too carelessly rushes into the pool of passions, not thinking about the consequences. Painfully betrayed and betrayed, but still believes in true love. She needs a strong and devoted partner, which will be endlessly taken care of.